My profile description explains the origins of my interest in sewing. But I wanted to share with you how I actually got started. Because talking to friends, I realise that quite a lot of people just don't know where to start. My first step was buying a sewing machine. I got myself a very basic Singer sewing machine. I was not sure that I was actually going to get into all this so I took it easy. 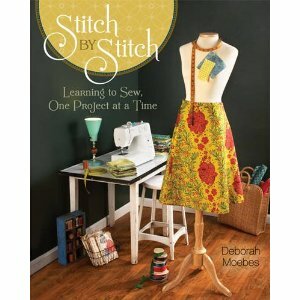 Then, I got myself this book: Stitch by Stitch: Learning to Sew, One Project at a Time. This book is great for anyone who wants to get started. It tells you what you need in terms of supplies, teaches you basic notions, how to thread you sewing machine, and gets you going with easy projects. Thanks so much Deborah Moebes! So there I was, went on line and bought all I needed to buy and set about sewing my first project!! Which I will not be posting, apologies for that, because it was a totally failed project (it was not a project from the book but a simple skirt from the internet). I can tell you why actually. It was supposed to be a simple skirt, instructions taken from there. The instructions say "Lay out a half yard of fabric". For some reason, I measured a half yard width (45.2 cm). I was so into my project that I did not realise my mistake and let me tell you ... the skirt was so narrow that none of my girls could have worn this skirt! So now I know, half a yard refers to the length. The lesson was learnt!